Multitasking and looking fabulous while she does it. Today, Andreas and I gave a Copenhagenize tour of the city and all its finest innovations. Afterwards, we had lunch on Queen Louise's Bridge and saw lots of cycle chic'sters. These multitasker photos are from the same spot, a few days ago. The Bullitt Boom Box. 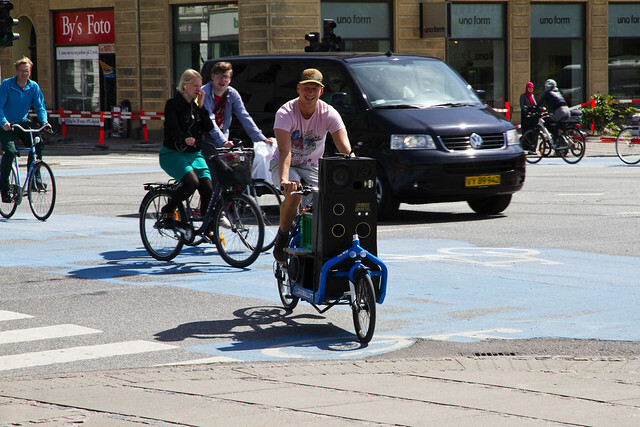 You can see, and hear, this guy cycling all over Copenhagen. 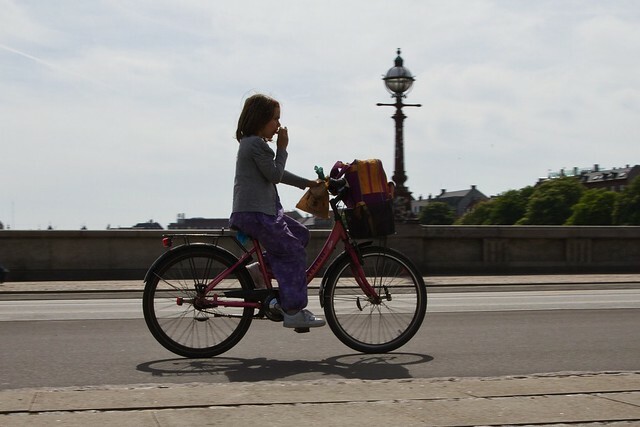 We got lucky as he parked his bicycle near us on the bridge, making it feel so perfectly summer. They teach their children well here. Is she picking her nose? 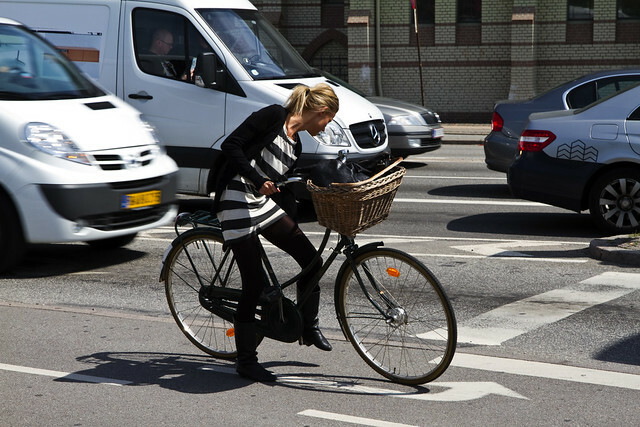 you say you went to the bridge and saw a lot of cycle chic'sters... well, no wonder, you are in Copenhagen!!! Everybody there looks fabulous and rides bikes. Do you want a real challenge? I would like to see at least one post, only one, with ugly Copenhageners on bikes or what ever other means of transportation unstylish ugly copenhageners use to move about your city!!! I know it will be hard, almost un natural, both for you to go look for these people, wherever they hide, and for the habitual visitor of the blog. I may offend some peoples aesthetic sensibility, but please, please, please, indulge me and challenge yourself!!! She could probably do that too, while simultaneously doing what she is actually doing: eating an apple. In her other hand she's also carrying a bakery bag. In all seriousness, we don't mean that only gorgeous super models are featured on this blog. 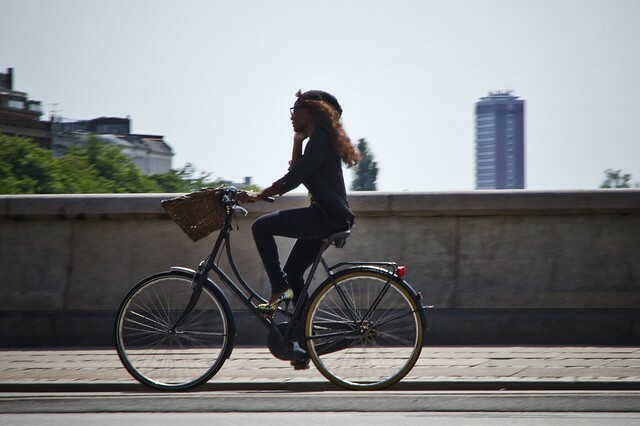 More that people using their bicycles create a certain graceful and elegant presence in the city. What they are doing is part of something beautiful, therefore we think they are beautiful. In that sense, you will never see an ugly person on this blog. I do grasp the concept and philosophy behind the blog, so I basically agree that nobody riding a bicycle will ever look ugly! And I have been to Copenhagen, and was overwhelmed by the amount of people cycling and maybe even more so by their sense of aesthetics and elegance. So what I am asking for is not "ugly" copenhageners, since we both know that doesn't exist, but could we say maybe a post about "funny" looking copenhageners? Something that doesn't look like supermodels on bikes? I am not asking to blend that into everyday posts. This is not some kind of "PC" attempt at representativity or anything. I love the blog just the way it is. But I would be curious to see just one post, with the theme of "odd" looking copenhageners. You are doing a great job, by the way!!! I could almost say you are better than Mikael in finding gorgeous looking girls. The one with the cello and the pink shoes has me in love already.